Wow, I can't believe the time is finally here! I start my final semester of college today, which seems crazy. I really never thought this day would come. Junior year was so rough. I suddenly had to adjust to living in an apartment off campus, having Simeon back in town, being a bible study leader, planning a wedding, having two jobs, and all that on top of taking 17 credits each semester. I did the worse that I had ever done in classes before and I had taken on way more than I could handle. But I've come so far from that rough year. I've decided to really take a chill semester after the last few years being rougher than I would have liked. By only taking the classes that I need to graduate (only 7 credits! ), I'm hoping to have more time to really dedicate to ramping up MPD and my blogging path. I"m also hoping to have time to workout and dedicate myself to spending more time in the word. When responsibilities started piling up last year, it was extremely hard for me to have a strong personal relationship with God because I had to check so many other things off my list in a week because of my responsibilities to other people. I'm looking forward to trying to be better at forging and continuing discipleship relationships with my old bible study girls as I'll now be freer to dedicate the kind of time that you really should in these kind of relationships. 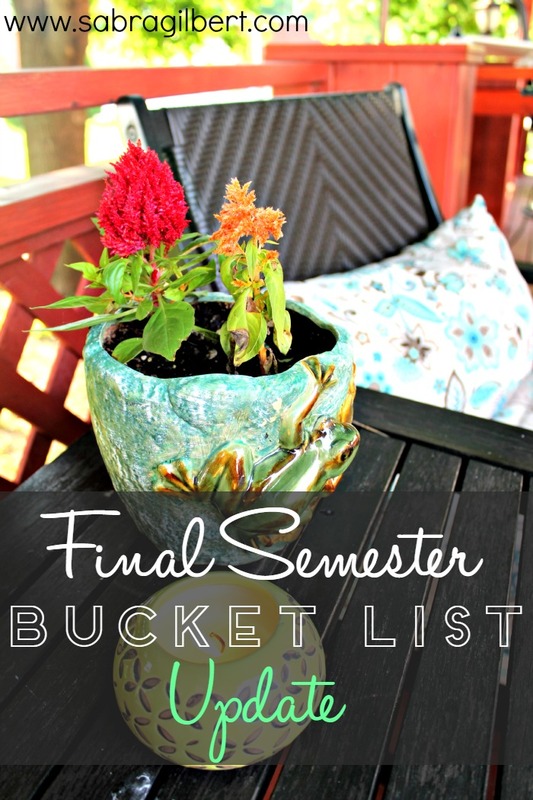 So here is my Final Semester Bucket List!! Back to School: Planner Organization & a Birthday Giveaway!! It's August! Which means one thing, it is back to school time! You can see it in the grocery store in how ramen and mac & cheese is getting pulled to the front and school supplies is shoved in everyone's faces! I know that it is coming by the random calls from my little sister panicking about what she needs for her first year of college! It's one of my favorite times because I love rebooting my organizing ways around this time to get all ready for the semester. Guys! This semester is my final college semester! This time next year, I don't know what I will be doing with myself. Or even where we will be living, but that is a story for another time and a worry for another day. My favorite thing to look for this time around is a new planner!! I bought my newest one back in April when the Day Designer came out with their May to April edition! I adore it. It is everything that I could ever ask for in a planner and it has taken me forever to find a planner that I could say that about. The number one tool for me to keep my planner organized is washi tape! I use it to mark off my catagories in the to do list part of my daily planner and also to mark off imprtant events in the monthly calender part of my planner. It just adds a pop of color to my everyday. My other favorite tool for blocking my days for classes or work on the hourly part of my planner are highlighters. I use different colors for different things. Green is for work (Dolla Dolla Bills yo!). Pink is for the time that I work on my blog. Yellow is for working on stuff for MPD. Blue is for classes. I like it alot more than using lines to block off my time and I still have the space to write in things that I have to do in that color block. I usually try to sit down a few times a week and work on dividing up my to do list to different days and planning out my week. I stuggle with meal planning but i'm trying to be better at it by putting it into my planner and making sure to put meat in the fridge the day before. August also means that it is my birthday month as well!! So for my birthday and because I love my Day Designer so much, I teamed up with some ladies to give away a Bluesky Day Designer and all the supplies you could ever want to plan your days away!! Included in this giveaway . . .